It is almost sunset. A warm wind blows over my bald head as I run barefoot on the shore of this nearly empty tropical beach. Accompanying me is my faithful golden retriever. Though she’s a little old, at least in dog years, she still has the energy of a puppy. We play with each other the way animals do when they are happy, blurring the line between man and beast. I am not far from my home; it is right on the beach. I look up to see my wife making dinner. She’s a very creative person and the kitchen is definitely one of the places that fosters her creativity. As the smell of the food wafts in the air, I glance at her through the kitchen window and see how lucky I am to have the life that I’ve always wanted. And right then I snap out of my daydream very abruptly. At the moment, I am nowhere near the water. In fact, I am standing in my kitchen, chopping a bell pepper, getting ready to make my breakfast for the day. The same breakfast that I make every day. I’ve been a dreamer all of my life. Moving between fantasy and reality happens constantly without requiring any effort from myself. My default mode is to drift away into an idyllic future or sometimes, when my anxiety runs high, into a dreadful one. 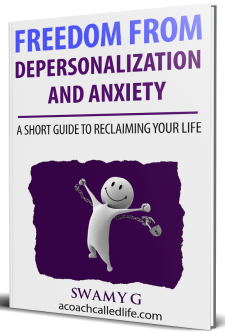 What doesn’t help is the depersonalization that I sometimes experience that merges both my worlds together and often in unpleasant ways. The experts say that a wandering mind is an unhappy mind. If that is the case then I probably am not a very happy person. I wouldn’t particularly categorize myself as someone like that, but what I do know is that the times I’ve experienced most happiness is when I’ve been wholly consumed by the present moment. The only moment as some would say. This usually happens when I’m writing, making music, working out with weights in the gym or rock climbing. The times when I’m wrestling with a technical engineering challenge at work is definitely one of those rare moments where I lose sense of my worries and troubles. I am seized by the moment, as the girl in the final few seconds of the movie Boyhood says. That feeling stays with me, but not for long. It’s got a very short half life. And before you know it, I am back to daydreaming about living a simple life elsewhere with my imagined partner, or something like that. Whenever I drift away into to a delightful fantasy, I come out of it and start comparing how I am here and not there. The times when I feel particularly sad or fearful, my mind wanders to the future and makes it look bleak and miserable. Something in me is unable to be with where I am in the present. I either escape into a comforting fantasy or extrapolate my present difficulties into the future. The hardest part about the human condition is the fact that the present moment is always eluding us, save for a few brief seconds here and there. A few days ago, a friend and I were having a conversation in a cozy hot tub on a chilly San Franciscan night. I told her how frustrated I was feeling with my current state of being. The reasons being plenty, but the few principals among them being the lack of meaning in my day job, the way the current immigration laws feel stifling to me and the lack of an intimate partner weighing in on me while I age slowly. There was a palpable sadness in my tone and an urge to confide these feelings with someone. After attentively listening to me, my friend, who is a very wise counselor, informed me that she can clearly see a pattern in my thinking. I just can’t seem to be able to hold the sadness and let it hang in there without stretching it into the future. According to my thinking, since I haven’t figured out yet how to turn my passion for helping others into a livelihood, my future self will also be afflicted with the same problem. If an intimate partnership seems lacking at the moment, then I am reminded that I am only getting older and my fantasy is incomplete without the company of a loving, attractive, playful partner. Whenever things are hard in any given moment, it is my tendency to fear that those hardships will stay with me in the future. The present, if it’s difficult, colors my future gray. When the future seems colorful, the present by comparison appears monochromatic. This mode of thinking strips the intensity and value of the moment we are in right now. There is always a silent comparison going on between my current self and the future or past version of me. I look back to my childhood and see how careless it was without worries and I look at my ideal future self only to feel frustrated because I don’t have a clear path to that future. In both these cases, there’s always something lacking right now. Something I once had has been lost or there is something in the future that I haven’t attained yet. In this way of being, the present moment is experienced as nothing but an unsatisfying conduit between a pleasant past and a blissful future. After I finished sharing my story with my friend and let the heat of the water in the hot tub soak into me, I felt some relief. Did she solve my problems? No. Did I end up having an epiphany about how to fix them? Not really. All I did was to make room for my frustration to come up and transpire. But I gained some insight that night. I am discovering that when the sadness or frustration visits me again, I don’t have to heed the stories that my mind comes up with in those moments but, instead, I just need to let the present moment contain whatever that is showing up. Part of my re-training is to see the now as the only truth that I can hold on to. 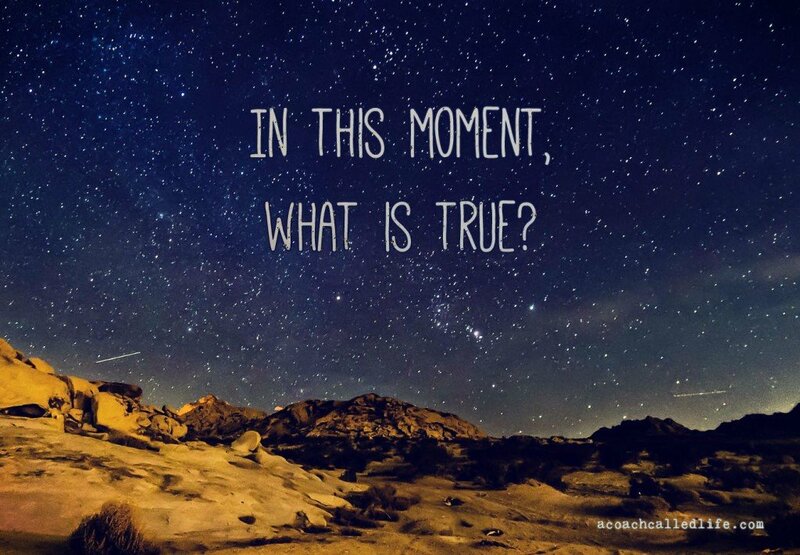 Whenever I experience a difficult feeling, be it sadness or fear, and my mind starts to wander, I have to remind myself to ask this one question – in this moment, what is true? By asking this, I can learn to see that what is showing up is only valid for this moment. By taking this approach, I can go beyond the stories my mind conjures up and seek to experience the underlying feeling without the mental chatter surrounding it. We rarely get to experience the underlying feeling without the mind’s constant analysis and judgment about that feeling. When some sadness hovers over me, the question “What is true in this moment?” helps me to see that only the experience of the sadness is true, the thoughts that come up about a dismal future don’t have any validity behind them. When I’m possessed by anxiety, this question often helps me cuts through the fallacies about my future that are conjured up by my agitated mind. In this way, I am learning to completely submit to the present moment, if not all the time, at least when a difficult emotion bubbles up. I am letting the present moment contain me and all of my feelings. I am learning to seek refuge in the now.